Stephen Friedman Gallery is pleased to announce a solo exhibition of new, large-scale works by American artist Channing Hansen. 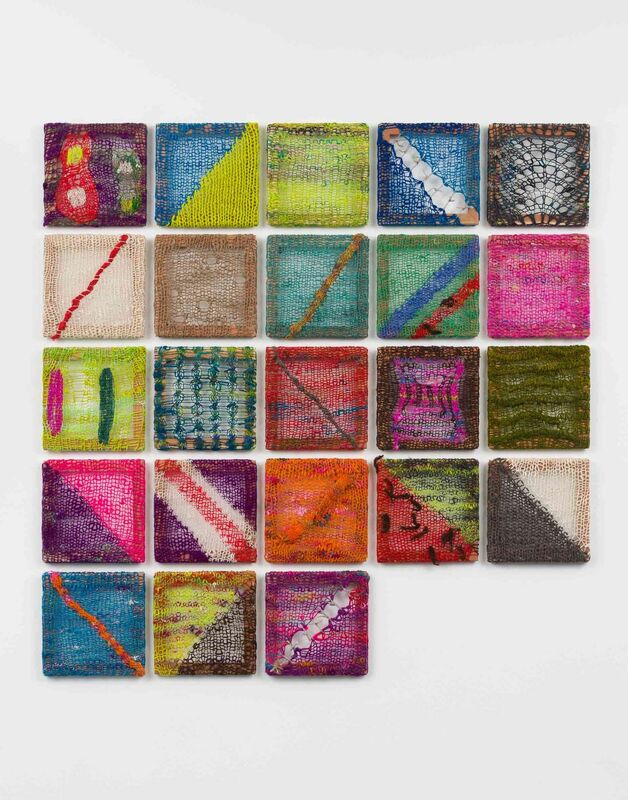 Hansen's vibrant paintings comprise abstract, hand-knitted constructions stretched over wooden frames. Developing his longstanding interest in the crossover between craft, art, science and technology, this new body of textiles is the most technically complex the artist has made to date. The exhibition takes the late work of Alan Turing, WWII code breaker and father of computer science, as its inspiration. Turing's theory of ‘morphogenesis' hypothesised how patterns and structures such as stripes, spots and spirals can form spontaneously in nature through genetic abnormalities. Inspired by Turing's biological principle, the design of Hansen's paintings in the exhibition are produced by a unique computer algorithm that can generate potentially infinite combinations of colour, fibre and knit. The artist is unaware of how the finished work will look until it is complete as he relies purely on the algorithm to prompt changes in form. ‘M: Index' (2018), a composite work comprising 23 individually-stretched paintings, symbolically represents the number of chromosomes that make up the structure of human DNA. As the title suggests, this work performs an indexical function, representing the different variables used to inform the creation of each of the paintings in the exhibition. While the composition emphasises the formulaic way in which the works were conceived, it also accentuates the stark differences in form, texture and colour that distinguishes each painting. The other works in the show demonstrate the breadth of diversity generated by Hansen's algorithm. Areas of dense, looped stitches within the works sit alongside open knots that reveal the wooden stretcher bars behind. Straddling the boundary between painting and sculpture, these works explore yarn's capacity to denote a line, plane or volume. Organic, amoeba-like forms intermingle with thin tendrils of yarn that dart across the surface of the textiles, interrupting solid blocks of vibrant colour. Reverberating with energy, Hansen generates a tension between chaos and order by containing these hallucinatory compositions within the confines of the picture plane. The type of wool used in Hansen's work highlights the artist's interest in how natural forms of diversity are manipulated by man. Collaborating with a sheep geneticist, Hansen uses wool from sheep that have been selectively bred to achieve variation in the colour of their fleeces. Effectively, they represent a triumph of genetic diversification. In the exhibition, Hansen specifically uses yarn from native British sheep breeds, many of which are no longer commercially produced due to the effects of monoculture in the farming industry. An extremely labour-intensive process, the artist skirts, washes, dyes, blends and spins the wool himself. In addition to fibre from these heritage sheep, the works incorporate other natural and synthetic fibres including bamboo, rose fibre and holographic polymers. Hansen's colour palette is based on the natural expression of the wool - greys, browns, blacks and whites - as well as colours drawn from the gaming app Candy Crush. The inclusion of these vibrant pigments stems from recent research recognising that Turing's theory of spontaneous patterning might have consequences outside chemistry and biology. In fact, the formation of addictive patterns in human behaviour, such as those associated with playing computer games, is akin to the system of pattern generation discovered by Turing. Here, Hansen combines technology, science and craft to striking effect.